So, why don’t people buy 3 of the latter for $3 instead of the former, even if you throw away 2 pieces because you’re full? One common tactic when arguing against free markets is to point out some unpleasant edge case and ask “how do you fix that?”. Therefore I think it quite reasonable to flip it back the other way and ask the Appartchiki what is to be done about the problems with state employee unions. The situation is quite different private sector unions, which can’t pay off corporate officers for favorable terms. State employee unions, however, can and do intervene in the election process. What does this get for the unions? Massive payouts that are starting to bankrupt entire cities and states. Working conditions and pay are also booming in the state sector. I agree that this creation of “two Americas”, one private and one of the state, with the latter serving as the aristocracy built on the former as serfs, is one of the biggest issues in the USA. Beyond that, such unions frequently oppose any reforms that would improve results which makes the spending even more inefficient. Of course, we have to keep in mind that modern unions are run for the benefit of the union leaders, not the rank and file1 2 3. It’s probably a big part of why they are increasingly unpopular (see here and here) even among potential union members — except in the state sector. The free market solution is to reduce the state sector, making this much less of a problem and allows citizens to pay attention to a greater part of the state’s activity. What solution is on the table from those who favor state intervention, other then tax increases without limit (although, really, once you get to 100%, you’ll have a bit of a problem). 1 During the health care nationalization debate, US Representative Stephen Lynch (D-Mass) stated he was opposed to the legislation because of the additional tax on union health care plans. Lynch is taking a position that protects union workers from getting slammed by the new excise tax. Do union bosses cheer Lynch for his stand? No — they’re threatening him instead. Who do the union bosses really represent these days? 2 The dismal state of union pensions which has been good for the leadership, perhaps not so good for rank and file expecting to draw them. 3 Union leaders’ support for President Obama which is not paying off so well. Has anyone else noticed how many fewer hijackings have occurred since this change? Another one for the pacifism kills files. Although it appears that the ‘deemed pass’ strategy has been abandoned I have to admit that I don’t see a Constitutional problem with it. To a large extent, the Constitution lets the Houses of Congress set their own internal rules and it’s not the place of even the Supreme Court of the United States to say differently. There’s a very nasty slippery slope there, if the judicial branch can start making rules for the legislative. If our polity is so broken that Congress can openly engage in tactics like these and get away with it, no judicial oversight is going to fix it. Our Bret wrote an excellent post on the costs to the putative beneficiaries of minimum wage laws. Of course, it’s clear that the actual beneficiaries are labor unions, but that’s not something supporters of such laws like to have discussed. But a rather different if related thought occurred to me, which is that the claims about increasing productivity during Obama’s War on Prosperity, are likely to prove disappointing mirages. That is because during economic downturns like this, it is the least productive who are the first to lose jobs. This of itself will cause a noticeable increase in average worker productivity. It’s one reason that European economies look more productive relative to the USA than they really are, because restrictive labor laws cause low productivity workers to be unemployed and therefore not counted in the statistics. I am starting some contracting work which involves Unix development, so I fired up a virtual machine and installed Fedora Core 12 on it. What I learned is that I don’t want to hear any more Unichs tell me how lousy Dark Empire software is because you have to download so many patches. For FC12, it was 647 patches out of the box. Better yet, the graphical user interface in the base operating system release has a bug where it can get wedged and never download another patch. Yes, everything has its little problems, but I think that the differences between various operating systems are a lot smaller than many like to admit. It’s finally come time for Social Security to start using the contents of the lock box in to which all the “extra” money was put. Unsurprisingly to anyone with clue, the box is empty and contains only notes that are only claims on current tax revenue, the same cashflow that funds the rest of the government. If all the notes had been taken out and burned it wouldn’t make a single dollar of difference (except we would have saved the storage costs). As we wind our way down to the really final ultimate terminal end-game of health care nationalization, I am still stunned that the Democratic Party caucus in Congress is trying to pass this thing. As others have noted everyone expects any meeting with constituents will result in negative pressure for the legislation, which is why the Democratic Party leadership is trying to get this done before Easter break. But, if everyone knows it, why doesn’t it have any effect now? Is the expectation that, once past, voters will give up in resignation and disgust? And if it’s pure ideology that’s driving, what difference would objections from voters make anyway? It’s simply bizarre to me. P.S. I think its going to pass and do massive damage to our nation and our health care, but it will sure be good for the lords of the plantation. here were promises of transparency and of a new kind of collaborative politics where establishment figures listened to ordinary Americans. We were going to see net spending cuts, tax cuts for nearly all Americans, an end to earmarks, legislation posted online for the public to review before it is signed into law, and a line-by-line review of the federal budget to remove wasteful programs. Mr. Obama made those promises because the ideas they represented were popular with average Americans. So popular, it turns out, that average Americans are organizing themselves in pursuit of the kind of good government Mr. Obama promised, but has not delivered. And that, in a nutshell, was the feel of the National Tea Party Convention. The political elites have failed, and citizens are stepping in to pick up the slack. The dirty little secret of the 2008 election is that Obama won by running on what is now essentially the TEA party platform. The Wall Street Journal had a headline teaser today, “When anger is an illness” and the voices in my head immediately chimed in “then you’re probably a MAList”. Does any one know why Orrin Judd is so negative about the Tea Party activists other than he’s a leftist who doesn’t like people getting in the way of expanding government? It is somewhat bizarre because the activists hew fairly well to the ideas of the Founders, which Judd lauds on a regular basis. Judd even complains about the exact same thing which adds a bit to the oddity. I would also note that I have been to Tea Party protests and “people reliving the 1960s” is almost as pure a case of projection as you’ll find. The Dalai Lama, the Tibetan spiritual leader, who was also denied a meeting in the Oval office today, expressed to Mr. Obama his admiration for the U.S. as a champion of democracy, freedom, and human values. 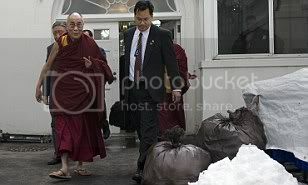 escorted the Dalai Lama to an exit where rubbish bags are kept on the grounds of the White House. What ever happened to Tibet as a burning political issue among the MAL? The same thing that happened to NOW and feminism under former President Clinton?